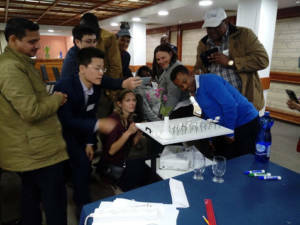 Ofri International Training Center, a division of the Ministry of Foreign Affairs overseeing the international cooperation in the field of education, produces occasional training courses for educators from developing countries. As part of an ongoing collaboration with the Sci Tech Israel Network, the network hosts tours of visiting educators in its schools, and organize unique workshops led by the network’s Research & Development Center team. 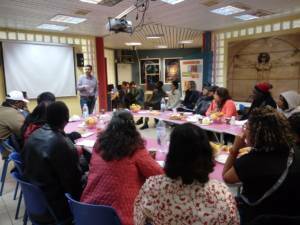 A group of 23 educators from various developing countries made a recent visit to Sci Tech Shein Comprehensive High School in Rehovot. Students and teachers from the Science & Engineering Programme presented their curriculum and some selected projects to the visitors. 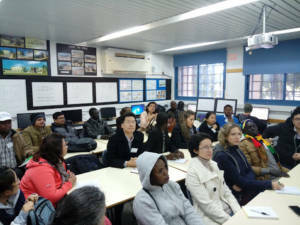 The group also visited the school’s Architecture Programme, heard about its curriculum and saw some selected students’ projects, as well as the Machinery Programme where they heard an overview of its unique curriculum which combines a matriculation certificate with a qualification as a certified technician. 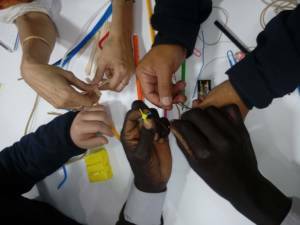 Later on in their visit, the group participated in two workshops which are part of the innovative Makers 101 programme, developed by Sci Tech Israel. 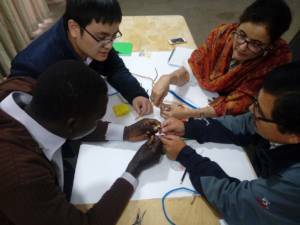 The Tinkering Workshop had the participants creating freely, using various materials and tools which included a vibration motor. This workshop demonstrates how various engineering principles and creative opportunities can be learned through free play. In the second workshop, the participants were asked to create a miniature model of a chair, based on a diagram. This workshop demonstrates how focused activity enables experimenting with reading a diagram and making a model.